It is just the merest of off dry and the smooth flowing, soft flavours are reminiscent of orange water; cumin, coriander, cardamom, fennel seeds and anise spices; the nectar of Asian fruits; sprinkled pink smoker lolly dust and a zing of mandarin and ginger like a pas de doux pirouetting across the stage as a final flourish – all the flavours linger gently, tempting you to taste again. Matched to braised pork fingers featuring highlights of orange juice and zest, coriander spice, fennel seeds, soy and ginger. Delicious. Made by Waimea Estates in Nelson, the wine has 13.5% abv, a screwcap closure and RRP NZ$23.00. 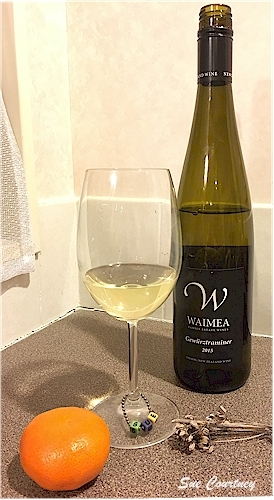 This entry was posted in #nzwine, gewurztraminer, nelson and tagged 2015, aromatic, waimea by Sue Courtney. Bookmark the permalink.